A funny thing happened while I was reviewing the 9.7-inch iPad Pro. I forgot my computer at home and only brought the iPad to work. This wasn’t intentional. I’m not doing the “Can the iPad Pro replace my laptop?” challenge. I tried that briefly with the 12.9-inch iPad Pro, and didn’t have the best results, constantly running into annoying little roadblocks and workarounds that slowed down my workflow. Even though the 12.9-inch iPad Pro is the most powerful iPad I’ve ever used, after I was done reviewing it, I didn't take it anywhere. Most of the time, it just sat on my desk. The 9.7-inch iPad Pro (can we call them Lil Pro and Big Pro, please?) is sized like an iPad Air 2, and it weighs just a hair under a pound. Like the iPad mini and iPad Air 2 before it, the Lil Pro seems to disappear into my bag, and I don’t mind taking it everywhere, much to the delight of my iPad-loving 4-year-old son. Lil Pro is exactly the same size as the iPad Air 2—most cases should fit, but old cases might obstruct the new iPad’s extra speakers. One of the advantages of the Big Pro’s screen size is that you have plenty of room to run two apps side by side in iOS 9’s splitscreen mode. Even with less real estate, side-by-side is great on the Lil Pro, too. With the Big Pro’s 2732x2048 display, each app’s half of the screen winds up being almost as big as the 2048x1536 Lil Pro held in portrait mode. But half of the Lil Pro’s screen still winds up being enough space to work in, even using text-heavy apps like Mail and Safari. I see a lot more webpages (including Macworld and even Apple.com) default to tablet or mobile views in splitscreen Safari, even though they load as the full-size version when Safari has the entire screen. That’s not a big deal, and even helps readability. Both sides of the screen stay active in splitscreen mode—I was able to play a Macworld video in Safari on one half of my screen while writing this review in Byword on the other half. The Lil Pro has one feature its big brother doesn’t, True Tone. This feature is enabled by a new ambient light sensor embedded in the Lil Pro’s display. Every iOS device has these ambient light sensors, which enable the Auto Brightness feature, but in the new Lil Pro, those sensors measure the color temperature of the light in the room, not just its intensity. That way, iOS can adjust the color temperature of your display, in an attempt to match it up, so your display doesn’t look more blue in some light and more yellow in others. You can turn this off in System Preferences > Display, but it’s a binary on/off switch. There’s no slider to lessen the intensity of the effect—the whole idea is that it’s automatically adjusted. The new Night Shift feature in iOS 9.3, on the other hand, isn’t controlled by sensors, so it does have a slider to let you adjust the intensity. (I can’t stand it at any more than about 25 percent, but your mileage may vary.) Night Shift isn’t aimed at matching the color temperature of the room; rather it just shifts the temperature of your screen from blue to yellow at night, in case the reduced blue light helps you sleep better—although the research isn’t so conclusive that this particular feature would help. You can use both Night Shift and True Tone together on this Lil Pro, but it looks terrible, like your screen was suddenly submerged in a bucket of apple juice. This screen is way too nice to yellow it up by layering True Tone and Night Shift together. I remain ambivalent about True Tone. I don’t mind keeping it on, but I wish I could tone it down just a tiny bit. Still, after a couple of days I stopped noticing it, until I had the Lil Pro side by side with a MacBook, and the MacBook screen’s blueish tint was more visible than ever. Anyone who does get hooked on True Tone may start jonesing for it on all their devices, and I wouldn’t be surprised if Apple starts building these new light sensors into more screens. In the meantime, there’s always f.lux on the Mac. The Lil Pro joins the Big Pro in supporting the Apple Pencil, which remains just delightful. In fact, it’s even more so now, just because more apps support it. I like drawing and coloring with the Pencil to relax, but I’m even taking more meeting notes with it lately, too, just because the “infinite scroll” writing feature in GoodNotes 4 is so fun. The Pencil is also better with the Lil Pro because it’s easier to hold the smaller iPad in one hand while you draw or write with the other. With the Big Pro, I felt like I had to be seated, preferably at a table, when I was going to do anything with the Pencil. The Smart Keyboard isn’t my favorite to type on, but I do like it as a slim protective cover, and its magnetic attachment is more convenient than a full case. It’s also worth pointing out that the Lil Pro starts at $200 cheaper than the Big Pro, and the Pencil is $99. The Lil Pro’s Smart Keyboard is $20 less too, at $149, compared to $169 for the Big Pro’s Smart Keyboard. So a full setup of a 32GB Wi-Fi-only iPad Pro, Smart Keyboard, and Pencil is $847 if you choose the smaller iPad Pro, and $1,067 if you choose the larger version. Oh, and if you use Microsoft Office, there’s another bit of potential cost savings from choosing the smaller iPad. Microsoft requires an Office 365 subscription if you want to create Office documents on a tablet larger than 10.1 inches—so that rule applies to the Big Pro but not the Lil Pro. If you don’t already have Office 365 for your Mac, you could save $7 per month or $70 per year (the price of Office 365 Personal) by avoiding buying it for your iPad Pro. I really appreciate the extra speaker power on both iPad Pro models, since I watch a lot of streaming movies and TV on my iPads. The four speakers provide enough oomph for an action movie, and make music and podcasts sound better when you’re listening without headphones too. The iSight camera on the Lil Pro is even better than the Big Pro’s camera, because it has a True Tone flash and supports Live Photos, which the Big Pro doesn’t. Plus, it records 4K video, while the Big Pro is stuck on 1080p. Want to shoot slo-mo? The Lil Pro lets you choose 1080p at 120fps or 720p at 240fps, while the Big Pro can only handle 720p at 120fps. Again, the Lil Pro’s physical size makes me more likely to use it to shoot stills or video, and even if you scoff at the very idea, don’t forget that plenty of apps use the cameras for things like augmented reality or even…well, shooting video. For example, an app called Hudl Technique lets you film a baseball, tennis, or golf swing and then analyze it in slo-mo for proper form and technique. It’s universal for iPhone and iPad, but the iPad’s bigger screen makes it a lot easier to use, and the camera captures enough detail that you can zoom way in on the way a wrist or ankle turns during a swing. It’s true that the Lil Pro has 2GB of RAM, or half the RAM of the Big Pro, which has 4GB. But bigger screens demand more resources to power them, and in testing with GeekBench 3, the Big Pro only scored about 6 percent better overall, so I don’t think many people will notice a performance hit in most tasks. Memory-specific tests show more of a discrepancy, because as it turns out, it’s not just the amount of RAM that’s different, but the memory bandwidth too. In Geekbench 3’s multi-core memory benchmark, the Big Pro scored 4112. On the Lil Pro, the same test produced 3203, or about 28 percent worse. In most tasks, you’re unlikely to see the impact of a little less memory bandwidth. Where it’s more likely to manifest itself is graphics-related tasks such as gaming. Is having half the RAM a dealbreaker? I would say no. In 3DMark’s Sling Shot Extreme test, for example, the Lil Pro scored 3146, about 20 percent worse than the Big Pro’s score of 3787. But when the same test was set to render offscreen, the Big Pro’s 3794 only bested the Little Pro’s 3528 by 7.5 percent. And in AnTuTu Benchmark app, the Lil Pro scored just 11 percent worse than the Big Pro. As a matter of policy, Apple doesn’t get into the weeds on its choices for the amount of RAM or how it’s configured. It could be that Apple selected slightly lower-speed RAM for the Lil Pro to save on power since the smaller unit has a smaller battery. Also, the smaller screen has a lower resolution, and Apple may have decided it didn’t need the highest performance RAM. 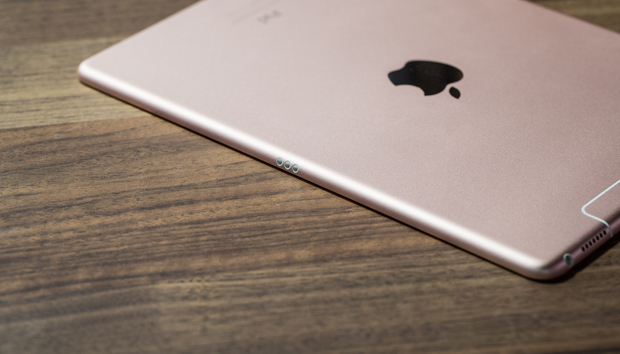 Oh yeah, and as of right now, this is the only iPad that comes in Rose Gold. For the most part, the amount of RAM is probably nothing to lose sleep over. There’s nary a performance difference in the computing side of things and even on graphics tasks, when you consider the resolution, the difference is pretty small, as well. When buying a Mac with configurable RAM, I tend to max it out at purchase as a way of “future proofing” the machine, hoping that the more RAM I have, the longer that Mac will last before it feels obsolete. If you can’t stand the thought of buying an iPad with half the maximum RAM available, you could shell out an extra $200 for the Big Pro, or wait to see what Apple does with these iPads next year. But for me, the 9.7-inch iPad Pro’s performance is worth its price and then some. If you’re using an iPad Air or older, the 9.7-inch iPad Pro is a worthy upgrade. If you’re trying to decide between a 12.9-inch iPad Pro and the smaller version, I’d go small because it’s a more convenient size, and the $200 price difference is worth the minimal decrease in performance, especially if you plan to spend that difference on Apple’s accessories.